Nearly TWO weeks behind this time! That's at least partly because I've read nothing but The Dresden Files and also because, while I'm still meeting my reading goals, I'm not ahead of them any more. I had a couple of weeks of pretty intense gaming - I go through phases where I watch a lot of TV, or game, or read, and this was definitely a gaming phase (Mass Effect 3, for those interested). But I realised I need to catch up on my reading again so this week I've been spending my evenings reading. Since the February update I've finished off books 10-12 of The Dresden Files and have nearly finished (hopefully will finish tonight) book 13. That leaves 1 more plus the short story collection. Then, finally, I'm caught up and can read something else! I'm not complaining really, I have really enjoyed the series, and once I'm caught up I'll probably do a more thorough review of the series to-date. In March I also signed up to Audible. I'd picked up the audiobook of The Atrocity Archives by Charles Stross, primarily because it was read by Gideon Emery (who has just the most fabulous voice, swoon), and I'd been listening to it in the car on my drive to and from work. After I finished that, I decided I wanted to do it more often, so I signed up to Audible and picked up A Game of Thrones by George R. R. Martin, read by Roy Dotrice. I've read the books before, repeatedly, and I wanted to do another re-read but was prevented from doing so by my Off the Shelf goals, so I figured this was a great way to fit in MOAR BOOKS. Roy Dotrice's reading sounds like a grandfather and I'm really enjoying it. The best thing is Goodreads includes audiobook formats too, so the audiobooks also count towards my overall reading goals without infringing on actual reading time! 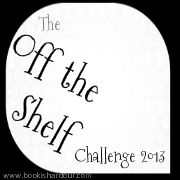 Bookish Ardour, whence came the Off the Shelf challenge, has also posted a blogging challenge which I think I will do. It's understandably book-themed, and while this blog is a bit more general than that, I still liked the sound of the challenge. It's only once a week posting which should be manageable. At least it will get me posting more than once a month. In the mean time, I'll keep ploughing through my reading goals! If you want to see my review of each book, check out my Goodreads page.